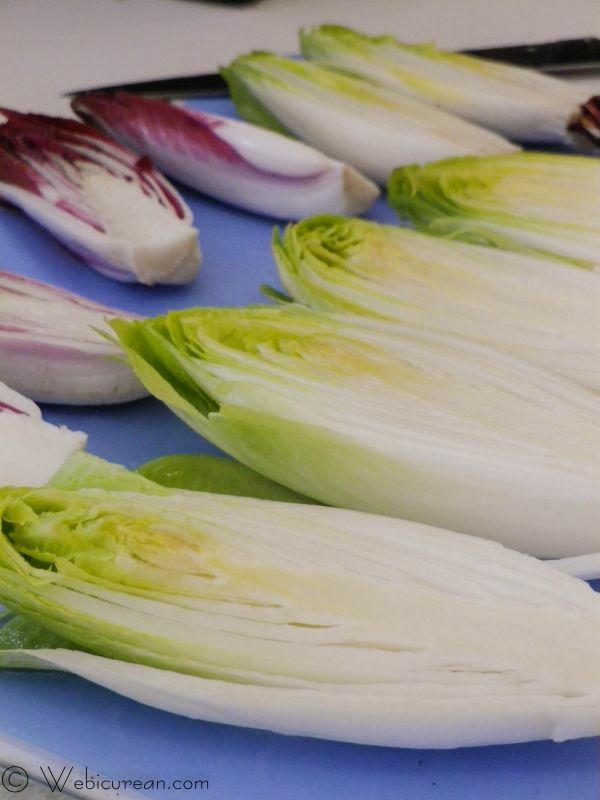 Belgian endive is one of those underrated vegetables. It’s certainly underutilized, but you won’t find me passing up on this gem when it’s served.Â J’adore. 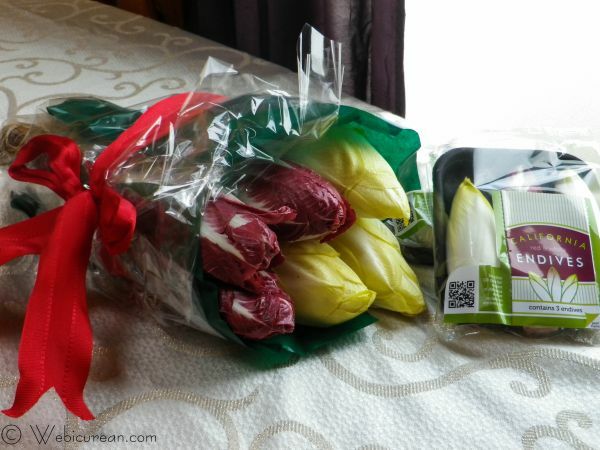 So imagine my delight at receiving this beautiful bouquet for Valentine’s Day from the folks at California Endive Farms. Look at that–it’s still on the root! And have you ever seen endive so plump? Truly a treat. 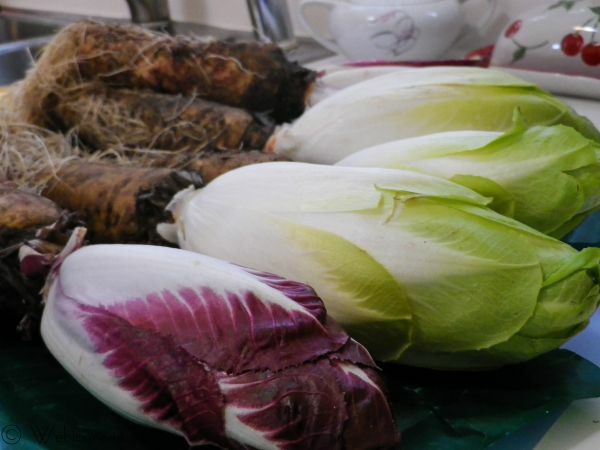 Belgian endive or witloof is actually a type of chicory that comes in a cone-shaped head of leaves. Its distinct flavor and crispness lends itself well to salads, and the leaves form the perfect edible scoop for dips. However, it’s not often that you see it cooked, and that’s the direction I wanted to go. Let’s just say, this was the best decision I made all day. The braised endives were buttery soft and slightly sweet. Braising mellowed out the bitterness, and what was left was a meltingly delicious plate of I can’t stop eating this. A simple yet sophisticated side for your next meal. There it is, root and all. If your endive arrived on the root, just snap those heads off. Wash, trim and halve the endive. Melt the butter in a large skillet, and place the endive in there cut side down. Brown well on both sides, then add water until about 3/4 inch deep. Cover and simmer about 25 minutes or until fork tender. Remove lid, increase heat, then reduce the liquid until thickened. Salt and pepper to taste. Pile up on a platter and serve. Browned then braised, the Belgian Endive loses its bitterness and becomes tender and buttery good. Melt the butter in a large, non-corrosive skillet over medium-high heat. Place the endive in the butter cut side down, and cook until golden brown. Flip over to brown the other side. Add enough water to the pan so that it's about ¾ inch deep. 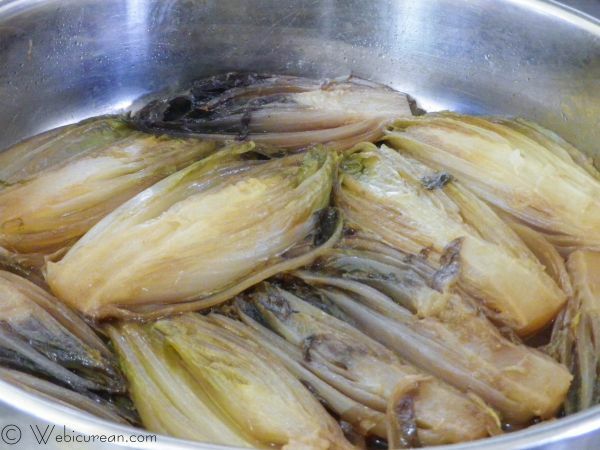 Reduce heat, cover and simmer for about 25 minutes or until the endive is tender. Turn up the heat, and reduce the liquid until thickened. Salt and pepper to taste. Thanks! 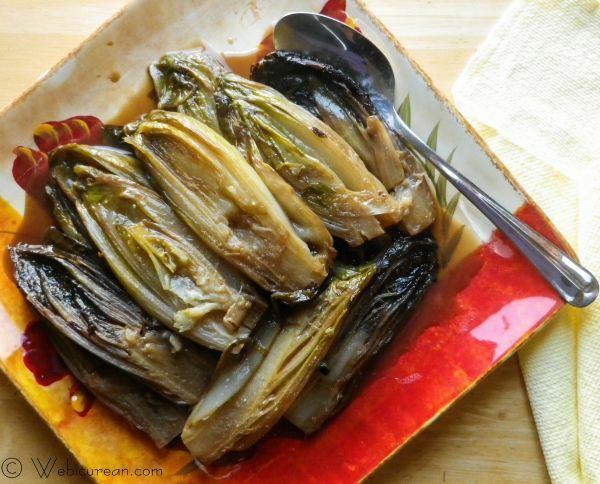 I’ll have to check that out–I’ve never tried grilled romaine, but if it’s as good as the braised endive, I need to correct that quick! I don’t think I have ever had an endive. It looks just like lettuce.. Like Lillian I have had grilled romaine before, Its really good. I’m sure this taste great. I will have to try some soon. Endive is a little bitter, but it’s also very crisp with a slight sweetness… really a great balance. Now I need to try the grilled romaine! 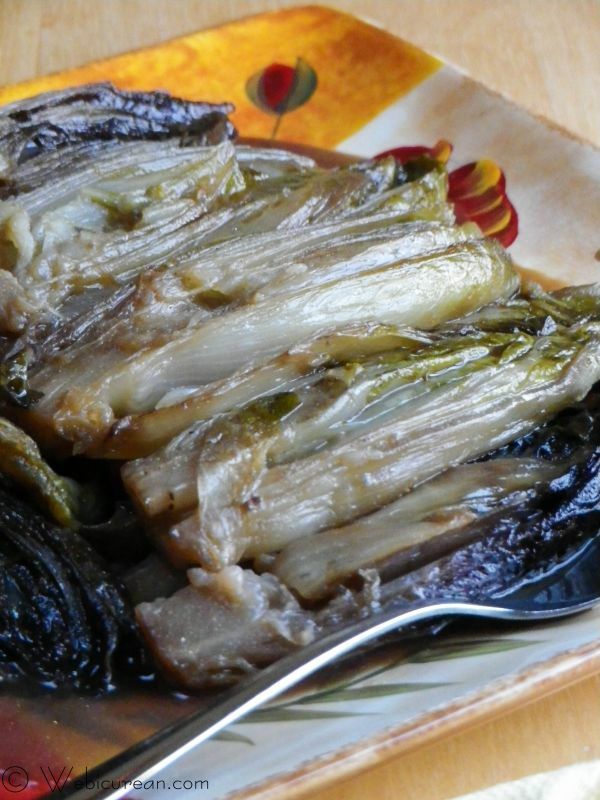 I recently discovered braising endives too – awesome!! I made mine braised in gin and orange juice, and they were outstanding. Your endives with the root still attached are so gorgeous! They certainly don’t come that way in my grocery store, lol. Thanks for sharing! oooh I’ll have to try that! 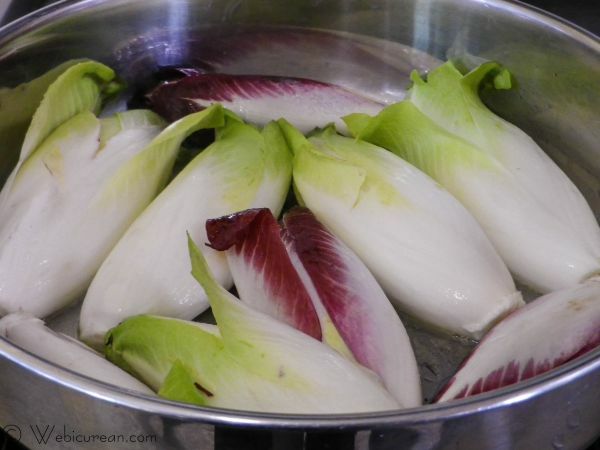 Beautiful recipes on your blog I’ve never cooked endive but it looks very good. Thanks! I think you’ll be pleasantly surprised at how wonderful the cooked endive tastes! I got a bouquet too! They’re beautiful!! I’m making something with endive this week to share too. How fun!